How Would You Wear This? 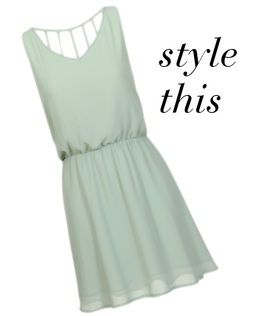 How would you style this pretty mint frock? I would add a pop of color with a belt! I would wear it with a white blazer, long gold necklace and pumps! I would wear dress it up with chic accessories and high fashion stilettos! is this some kind of contest? do i win a prize if i answer? also, where is it from? So cute with a purple hat, black boots (high-heel and knee-length), brown belt, and black hand warmers.